Way To Put List (i.e. To Do) Items "On the Agenda"
I’m pretty sure this has been answered somewhere, but probably not for Agenda 2.0. I searched using several phrases but couldn’t get an answer. If you have Multiple Projects with multiple Notes, some of those notes might have one or more To-Do Items (i.e. lists as checklists). Surely there is a way to get them all “On the Agenda” to get a master list of things to be done and that are outstanding. Thanks for any help here and I’m sorry if I’ve overlooked an answer somewhere. You haven’t missed anything. At the moment there is no “summary view”, which sounds like what you want. There is no way to see all the checkbox items only. We would like to add that at some point, but for now you only see complete notes. Hope this explains it. We want to improve this aspect, but for now it is note focussed. Perfectly understandable. As a kind of “global” solution or direction, you might just allow Agenda to interface to Todoist, 2Do, Things and maybe one or two others. That way you keep your autonomy as a project journal, and provide a useful function for those of us that need to tie out our action items. Interestingly enough, when you right-click on a bullet/checklist/to-do item, one of the services that’s listed in that Dialog is Todoist. 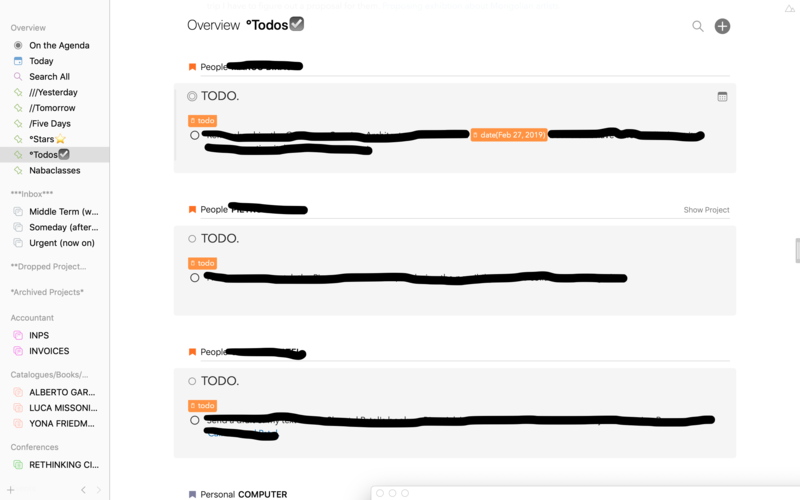 Clicking on that DOES infect start up Todoist on my computer, but no data is passed there I have no idea how much work that is, but it would doesn’t seem to be much more work than integrating to calendars I figure. I’d expect that to be a premium feature. Go to a checklist item, then highlight it. Then right-click to get that contextual menu! I found Todoist there in the Share dialog. I was able to check Todoist in that list easily. Exit that dialog (which closes everything. Right-click to again get the contextual menu. Choose SHARE, and “Add to Todoist” will now be there. Click on that, and up pops the Todoist quick add function. Add your date and particular project and voila! Instant integration. Again this may work for Things, or 2Do, since both of those have services also. Perhaps something your users might would like to know. i don’t have Todoist, but this procedure works with Airmail as well! Even I would prefer this could work with Spark, that is the email client I use more. But the interesting thing is that potentially this procedure could work with many other apps integrated on the Mac! Indeed, that is a nice trick. That share menu is standard with any text, so it works fine in that context. We want to add this type of sharing now for whole notes, in edition to the selected text that works now, but when it comes to to-do items, this is exactly the type of sharing you need. Actually it works even with Spark, I tried now. The only difference is that in Airmail beta you have the possibility to add the text and finishing to compose the email directly inside Agenda, without moving to the email App. That is very good! That’s completely understandable, and I wouldn’t be how possible it was. Thinking about it, a calendar is by its nature a good filter to view what will mostly be a limited list of events on any given day. Whereas a list of tasks in something like Todoist might be more weildy. Although I’ve just had a little bit of an epiphany and realised that Todoist tasks can be added as calendar events, so would be visible in Agenda. I really like Agenda though, so will definitely migrate from Evernote for general note stuff once you roll out your iOS app. The option of making the calendar view persist in the top right. Coloured dotes beneath the dates in the calendar if there is an event on that date. Presumably if its pulling that stuff from the calendar, that might be possible? But really great looking app though! I’d like to also throw my support behind this feature. The thing I like about the Agenda approach is the all in one solution idea which includes some way to create tasks and have a single place to see/manage them. I use Agenda heavily at work and one thing I do is to add checklist items on meeting notes. More often that I would like these checklist disappears in the mist of notes, projects and other stuff. One way to avoid this (and still maintain a fairly clean “On the Agenda” view) could be a dedicated “TODO” agenda item that shows all un-checked items and perhaps a link to the note/project containing each item (also, ideally grouped by project). We have thoughts about checklist management. Stay tuned! Awesome program BTW. One small feature I also miss is moving paragraphs by Shift-CMD-Up/Down Arrow, this is standard in many other programs (Office, OneNote,…) and really makes list handling easy. This way todos/notes can be easily ordered. Perhaps a start before the big changes can be implemented…. Thank you for the feedback! Very useful. For me having a master list of things to be done and that are outstanding is the missing feature in Agenda. At the moment I am using Daily Notes, which has a note taking and task manager in one, but which is a bit old-fashioned. A master list of things to be done would it make worthwhile for me to switch to Agenda. Therefore I am keen to known what the plans and planning are for such a a master list of things to be done. Yes, we have plans to add such an overview indeed. Great to hear. Any idea about the timing for that? For the moment, I put at the top of any project a list of To do, with a tag calls “todo" that I saved in the Search All and put on the Overview list. So, when I click on it I can have a Master list of all the most important todos in all my projects. When a project is over or I have completed a list of todos I can simply erase the tag and this list won’t appear anymore in my master list of todos. (see the pic attached). Maybe this solution can temporarily help. Can’t give any deadlines. I would hope we would get to it this year, but more than that I can’t say (and maybe even that is saying too much).